The first time you add a Google Drive card to a FLO, you will need to create a configuration. This will allow you to connect to your account, save your account information, and reuse that configuration next time you build a FLO with the connector. That way, you don’t have to sign in every time you want to build a FLO with this Connector. Instead, use the configuration you have already set up. You can create and save multiple configurations and share them with your teammates. First, enter in an Account Nickname. This should be unique so if you are connecting multiple Google Drive accounts you will be able to tell them apart. This event trigger will fire when a new file is created inside of GoogleDrive or added to GoogleDrive. Create the folder in Google Drive and give it a name. Create the File Created card for Google Drive in Azuqua. Scroll search and select the folder name. Leave the Folder ID field blank. Create the folder in Google Drive. Navigate to the folder in Google Drive. Copy the Folder ID found in the URL. This is everything that comes after “folder/” in the URL. For example, if the URL was “https://drive.google.com/drive/folders/1dyUEebJaFnWa3Z4n0BFMVAXQ7mfUH11g”, then the Folder ID would be “1dyUEebJaFnWa3Z4n0BFMVAXQ7mfUH11g”. Select “-- Use Folder ID --” for the Folder option. Input the Folder ID from Google Drive into the Folder ID field in Azuqua. File Name(text): Name of the file. File ID (text): Unique ID of the file. Folder (list): Option to select folder to insert file in. Description (text): Description of the file. True (text): A file has a “Starred” label applied to it. False (text): A file does not have a “Starred” label applied to it. Parent Item ID (list): Provides a list output for all of the parent folders inside of which the file that created this workflow exists. Version (text): A monotonically increasing version number for the file. This reflects every change made to the file on the server, even those not visible to the requesting user. Web View Link (URL): Url directly to the link that will pull up the folder inside GoogleDrive. Thumbnail Link (URL): A short-lived link to the file’s thumbnail. Typically lasts on the order of hours. Created Time(date - iso format): Date when the File was created. Modified Time (date - iso format): Date when the File was last modified. Last Modified User (text): Name of the user who last modified the file. Shared (true/false): whether the file is shared and accessible or not. Owner (text): Name of the person who owns the file. Editors (list): List of names of people who have edit access to the file. Viewers (list): List of names of people who have viewer access to the file. Commenters (list): List of names of people who have comment access to the file. Allow File Discovery (true/false): whether the file is discoverable or not via search inside GoogleDrive. Writers Can Share (true/false): whether the people with write access can share the file. Viewers Can Copy Content (true/false): whether views can download, print, and copy this file. This event trigger will fire when a file is updated inside of GoogleDrive or added to GoogleDrive. This event trigger will fire when a new folder is created inside of GoogleDrive or added to GoogleDrive. Folder Name(text): Name of the folder. Folder ID (text): Unique ID of the folder. True (text): A folder has a “Starred” label applied to it. False (text): A folder does not have a “Starred” label applied to it. Parent Item ID (list): Provides a list output for all of the parent folders inside of which the folder that created this workflow exists. Version (text): A monotonically increasing version number for the folder. This reflects every change made to the folder on the server, even those not visible to the requesting user. Thumbnail Link (URL): A short-lived link to the folder’s thumbnail. Typically lasts on the order of hours. Created Time(date - iso format): Date when the folder was created. Modified Time (date - iso format): Date when the folder was last modified. Capabilites (list of text): The capabilities the folder has. Last Modified User (text): Name of the user who last modified the folder. Shared (true/false): whether the folder is shared and accessible or not. Owner (text): Name of the person who owns the folder. Editors (list): List of names of people who have edit access to the folder. Viewers (list): List of names of people who have viewer access to the folder. Commenters (list): List of names of people who have comment access to the folder. Allow File Discovery (true/false): whether the folder is discoverable or not via search inside GoogleDrive. Writers Can Share (true/false): whether the people with write access can share the folder. Viewers Can Copy Content (true/false): whether views can download, print, and copy this folder. This event trigger will fire when a folder is updated inside of GoogleDrive or added to GoogleDrive. Triggers a FLO when a new comment is made in Google Docs or Google Drive. File ID (text): The ID of the file you wish to use to trigger the FLO when it gets a new comment. File IDs can be found in the URL of the file. Author(text): Who wrote the comment. Action(text): Actions on the comment i.e “Assign to [name]“. Created Time(text): When the comment was created. Add a comment to a file inside a Google Drive. The ID of a file can be found by navigating to the Google Drive web. Right click on the file you need, and select get sharable link. The File ID is the last part of that link, after id=. Example: https://drive.google.com/open?id=1avkd2a. Make certain to select the entire ID (about 20 characters long). Alternatively, use the search files card to find the file by name. This card has a File ID output that can be dragged into this input field. Content (text): the comment to be associated with the file. Comment ID (text): the unique id generated by creating the comment on the file. Created Time (text): the date that the comment was created at. Author (text): the person who created the comment. Copies a Google Drive file. File ID (text): The unique file ID. Can be found in the file URL or by using Search Files. Parent Folder ID (text): The unique folder ID if the file is in a nested folder. Can be found by using Search Folders. Starred (boolean) : If the document is starred or not. Viewers Can Copy Content (boolean): If viewers can copy the content. Writers Can Share (boolean): If writers can share the file. File ID (text): The copy file ID. File Name(text): The new file name. “Copy of ” with the original file name. If no file name exists the file name will be “Copy of Untitled Document”. Use this card if you want to create a new folder for your google drive to place documents inside. The folder can be placed within a folder as well. When you create a folder you have a few options for its properties. 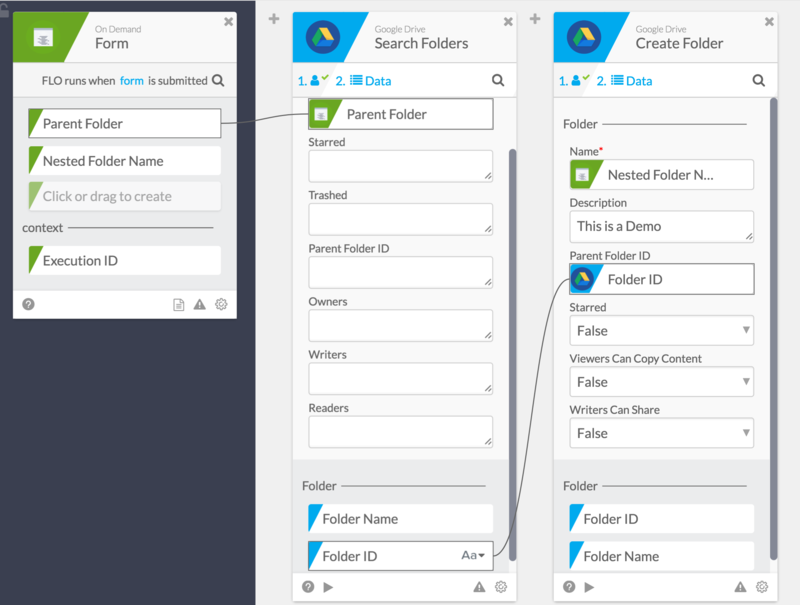 Parent Folder ID (text) To create a folder within another folder (or nested folder) there are two methods to get the parent folder ID or location for the card. Copy the end of the URL into the card to get the parent folder ID. For example, if the link was https://drive.google.com/drive/folders/**0B8CedcLXfL-xSHpiQEYyZDYyfEU**, you would copy and paste the bolded region after the slash as the Parent Folder ID. You can also search for the folder to get the ID. Create a form which asks for the name of the parent folder and then with a search folders Google Drive card return the Folder ID. This ID can then be used as the Parent Folder ID in the last card shown below. Create permissions for users to interact with documents in Google Drive. Permission Type (dropdown list): The type of user, group, domain, or Google Drive user who can interact with the specified document. Permission Role (dropdown list): The level of permissions the user, group, domain or “anyone” can have with the specified document. Email Address (text): email address of the individual who is having permissions created for. Email Message (text):A custom message to include in notification emails about the permissions and document that were shared. Allow File Discovery (true/false): Whether the file will be discoverable or not. Permission ID (type): The current user’s ID as visible in the permissions collection. Share Link (URL): Url directly to the link that will pull up the file inside GoogleDrive, but is the share link for the user or group shared to the file with the permission set. Use this card if you want to permanently delete a file. This file does not get moved to the trash. To execute this action on team files, the user must be an organizer of the parent folder. To delete folders, you have to be the owner of that folder and all it’s contents. Download a file by its id from Google Drive. Look up the permission settings of a particular user for a particular file. Email (email): the email address to get permission information for. Permission ID (text): Permission ID for the email searched for. Display Name (text): Display name of the email searched for. Role (text): Role associated with the email. Use this action to move the location of a file or folder within GoogleDrive. File or Folder ID (text): Unique ID of the File or Folder that is intended to be moved. Parent Item ID (text): Unique ID of the location folder where you wish to move item to. File or Folder ID (text): Unique ID of the File or Folder that was moved. File or Folder Name (text): Name of the file or folder that was moved. Get metadata information about a file. File - data associated specifically with the file. Parent Item ID (list): Provides a list output for all of the parent folders inside of which the file you read information exists. Web View Link (URL): Url directly to the link that will pull up the file inside GoogleDrive. Permissions - permissions specific information about the file. Viewers Can Copy Content (true/false): whether views can copy, download or print the file. Get metadata information about a folder. Folder - data associated specifically with the folder. Parent Folder ID (list): Provides a list output for all of the parent folders inside of which the folder you read information exists. Permissions - permissions specific information about the folder. Viewers Can Copy Content (true/false): whether views can copy out of the folder. Search for files by parameters. Not all of the fields are mandatory. Most often the search will only contain the “Name” field, but if you want to scope the search to more specific locations the more inputs are used the narrower the scope of the search will be. True (text): A folder has a “Trashed” label applied to it. Parent Folder ID (dropdown): The unique ID of the parent folder inside of which the file you are searching. Owner (list): Name of the persons who own the file. Writers (list): List of names of people who have edit access to the file. Readers (list): List of names of people who have viewer access to the file. Commenters (list): List of names of people who have commenter access to the file. File ID (text): Unique ID of the files matching searched criteria. Insert data into the “Input” fields in order to find a single folder within your GoogleDrive environment. Not all of the fields are mandatory. Most often the search will only contain the “Name” field, but if you want to scope the search to more specific folders the more inputs are used the narrower the scope of the search will be. IMPORTANT: This action only returns one folder result, even if more than one result would technically fit the inputs chosen. Starred(True/False): “True” or ”False” are the accepted inputs. True (text): A folder that has a “Starred” label applied to it. Trashed (True/False): “True” or ”False” are the accepted inputs. True (text): A folder that has been Trashed. False (text): A folder that has not been Trashed. Parent Folder ID (text): The unique ID of the parent folder inside of which the folder you are searching for should exist. Owners (list): Name of the persons who own the folder. Writers (list): List of names of people who have edit access to the folder. Readers (list): List of names of people who have viewer access to the folder. Folder Name (text): name of the folder if found. Folder ID (text): Unique ID of the folder if found. Use this card if you want to update the core content of the file, but keep the previous versions, metadata and other items in place. This card is used to swap the foundational content of a file. File Content ID (file): Unique ID of the content associated with the file you wish to swap into the file of GoogleDrive. Add or change file info for a Google Drive file. File ID (text): the unique identifier for a file. Found in the URL of the file or by using Search Files. Name (text): The file name. Parent Folder ID (text): If the file is within nested folder. ID can be found by using Search Folders. Starred (boolean): Starred or not. Viewers Can Copy Content (boolean): If the content can be copied. Update the permission settings of a particular user for a particular file. NOTE: currently investigating a bug in this action that results in a “Not Found” error. If you are seeing that error, please contact our support – we are working on a fix. Role (text): Role you want to set the user to, e.g. : organizer, owner, writer, commenter, or reader. Remove Expiration (true/false): Whether or not to remove any existing expiration date associated with the permission. Transfer Ownership (true/false): Must be set to True if setting a new owner, in which case the previous owner is assigned to “Can Edit” (writer). This card can manipulate multiple fields of information about a Google Drive folder. It’s required to first input the Folder ID to change its information. Use the “Search Folders” card and input the fields and move the output “Folder ID” to this card. More information about this function here. Another method is to copy and paste a portion of the link. For example, if the link is https://drive.google.com/drive/folders/**088CedcLTfL-xNjZYaC1qbEN6SEE **only copy and paste the bolded segment into the Folder ID input. Type in a new name for the folder to change it. If the folder is nested, or a folder within a folder, include the ID of the parent folder. This can be found the same way as instructed above for the Folder ID. You can move a folder to be within another folder this way. Type in an edited description of the folder. Check yes or no to decide if writers can share the folder. Check yes or no to decide if viewers can copy content. The output is an updated folder in Google Drive. Parent Folder ID (text): ID of the folder you want to upload the file to. Leave empty for root.